TopVintage LOVES Lola Ramona! And thankfully this love is mutual ;-) That's why we decided to collaborate and release this awesome autumn collection! 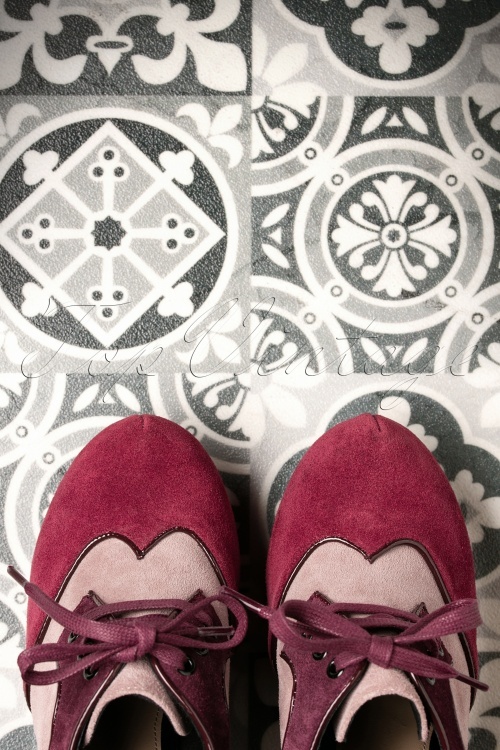 May we introduce the 50s Angie Ton sur Ton Suede Booties in Merlot? They've got that ton sur ton thing going on! Because these lace up booties are made of suede in different shades of wine-red and pink, finished off with shiny patent leather piping! The sturdy, high heel adds the perfect finishing touch and thanks to the combination with the hidden platform, you'll feel like you're walking on air! Merlot is the way to go! These shoes are just a dream! They look absolutely stunning and they are soooo comfortable! The hidden platform gives stability and comfort as promised in the description. They look perfect to a skirt or dress and the colours are exactly the same as on the pictures. Just fabulous! Heerlijke schoenen, ook voor wat bredere voet. Kleur tussen bordeauxrood en paars. Ik ben er helemaal weg van. Lola Ramona macht für mich die schönsten und dazu noch bequemsten Schuhe. Was will Frau mehr?